Copy your favorite pictures from your computer to the Digital Photo Keychain and always have a quick and easy way to view your photos. The Digital Photo Keychain that fits in your Pocket! Digital Photo Keychain is a digital photo album that is the size of a credit card. It holds 58 wallet-sized photos in just one tiny device. Copy your favorite pictures from your computer to the Digital Photo Keychain and always have a Carry all those meaningful photos with you wherever you go! Copy your favorite pictures from your computer to the Digital Photo Keychain and always have a quick and easy way to view your photos. It's great for sharing with friends too. So simple to use and small enough to fit on your keychain, wallet, purse or pocket, the hardest part is deciding which pictures you want to have with you! Copy your favorite pictures from your computer to the Digital Photo Keychain and always have a The Digital Photo Keychain that fits in your Pocket! 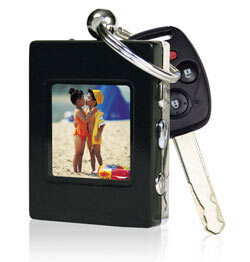 Digital Photo Keychain is a digital photo album that is the size of a credit card. It holds 58 wallet-sized photos in just one tiny device. It comes with the batteries included so you can start using it right away. Digital Photo Keychain is available in Black or White.